Jakarta Governor, Anies Baswedan reminds people, especially who live in Ciliwung Riverbank, to be aware of flood since Katulampa Bogor Dam water level has reached Alert 1.
" 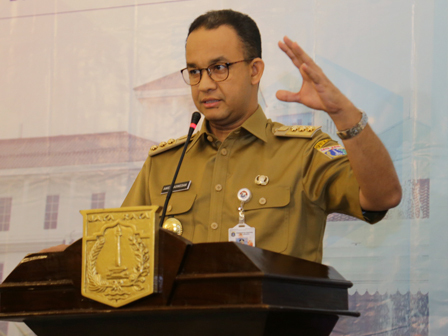 I have instructed all SKPDs and UKPDs to anticipate it"
Anies conveyed, his side has communicated with Bogor Mayor, West Java, Bima Arya to know the current condition. "Water level has reached 240 centimeters. Alert 1 status was received at 8.30 AM and we estimated water flood will enter Jakarta around 9 hours ahead," he stated, City Hall, Monday (2/5). He explained, water level in Marina Beach, North Jakarta, is 184 centimeters high. Currently, all floodgates are opened maximally. "I have instructed all SKPDs and UKPDs to anticipate it. Resident doesn't need to worry," he added. He explained, Jakarta Provincial Government prepares 450 pumps, both stationer and mobile pumps, into areas prone to inundation. "We prepare mobile pumps in Cililitan, Bukit Duri, Bidaracina, Kampung Melayu,and Cawang," he said.